Understanding organizational culture is a critical component to the success of a project. I was able to see this first-hand during a large acquisition project I worked on recently. We acquired one of our competitors who employed over 4,500 employees. The goal of the project was to successfully integrate our two companies together and eventually operate both businesses in a uniform way. Both companies delivered a similar service, but the organizational structures and company cultures were very different. We knew this would pose a challenge to the project as we set out to combine the two together. 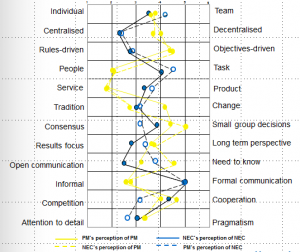 The solid yellow line is the acquired company (PM) assessment of their culture. 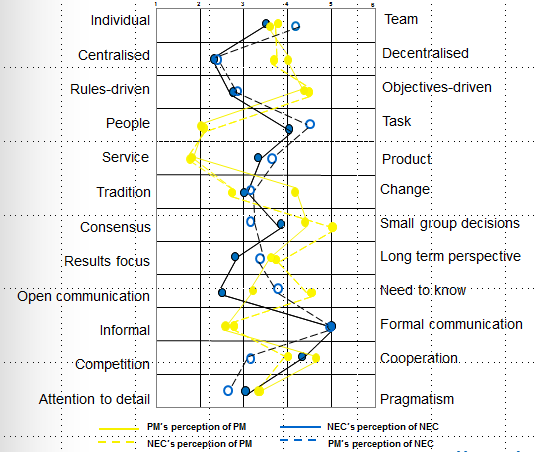 The dotted yellow is the purchasing company (NEC) perception of PM’s culture. The blue lines are the same assessment for NEC. We discovered the employees from both companies had a very good idea about the culture of the other company, and we could easily identify where our cultures differed from one another. This information became central to the project and assisted us in managing the integration. We were careful not to make drastic changes in areas where our cultures differed, and move quickly to integrate in areas where our companies were aligned. An additional benefit was the positive view the employees from the acquired company had about NEC. The interest we showed in learning about their culture and applying what we learned built trust between the two groups. This trust became the platform to support all future integration efforts. Ultimately, by paying attention to organizational culture we were able to complete the integration project on-time and integration synergies were achieved earlier than planned. The concept of organizational culture and the effect it has on project management is supported by a recent article I read from on the Projectmanagement.com website. Click here to link to the article. The article indicates the most valuable training a project manager can have is organizational culture training. The author recommends culture based training for project managers and project participants. The training material should enable project teams to identify, assess and address issues related to organization’s work culture. The efforts will be most successful when lessons learned from previous projects at a company can be shared and leveraged to ensure future projects are equally successful. Have you ever worked with an organizational culture survey as part of a project? Did you find it helpful?